Three cheers for the red, white and blue! An adult hostess apron from the 1940’s or 1950’s. 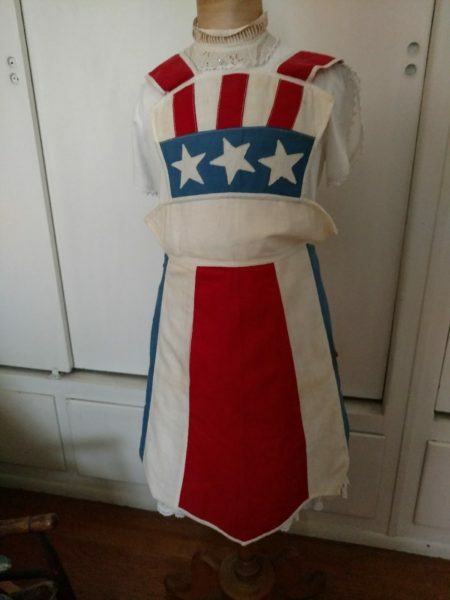 A vintage home sewn apron just in time for that holiday party! The bib style apron, made of red, white and blue muslin cotton, is sewn in stripes. A large white star is hand appliqued, on the blue, on either side. A shield design forms the bib of the apron, with red and white stripes over a field of blue. Three smaller white stars are appliqued across the front of the blue. White bias tape finishes the edges of the apron.